Last year, SAP released an application to enable management and reporting of American Recovery and Reinvestment (ARRA aka stimulus package) Funds. The Act specifically mandates that government agencies provide transparent reporting to citizens showing monies spent and impacts made – financial, jobs and more. What’s really interesting about this application is how it was developed. Using “off the shelf” components from SAP Business Objects, “From start to deployment of this solution took us only about 60 days” according to Mark Testoni, President of SAP Public Services in an interview with Executive Biz. Ultimately, what makes this speed possible is the data and the tools. As I have mentioned earlier here and here, open access to government data is key to building these types of applications. 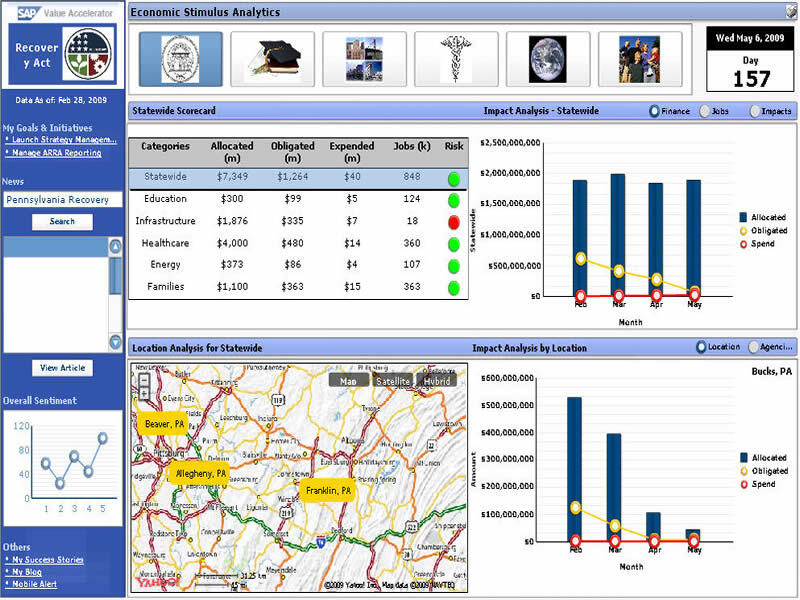 Once the data is open, vendors like SAP, along with ordinary citizens can do analysis and create reports. What is even more powerful is when we start to see applications that mash-up disparate data sets. For example, it would be great to see stimulus spending and jobs created correlated with latest unemployment statistics together with projected job growth by industry with cost of living indexes for the major cities in that state. The tools are the second speed component. Whether using SAP Business Objects tools such as Xcelsius or Crystal Reports, or coding from scratch, reusable components and sharable templates can greatly accelerate development. Each application will have a different focus but there remains a large degree of commonality. Publishing tools and templates for reuse inside and outside your organization will help future projects develop quickly. The challenges of integrating, connecting, aggregating and validating these disparate data sets can be daunting. Each government department can have different data standards, reporting periods and quality measures. Before one can come up with a visual report, it pays to invest in data quality and integration processes. In this case, SAP is using its own data federation and data quality tools. Going forward, this is a service that should be provided as part of a government data infrastructure. That would allow all developers to build robust applications delivering insight to fellow citizens and decision makers.